Islander’s baptism and confirmation name incorporates “Maria,” a custom from her ancestors of Catholic Spain who traditionally choose the name of a patron saint so the baby will grow up having some of the role model’s virtues in life. Islander was inspired by her namesake to make a cake in her honor for one of the Marian holidays. She was also inspired by a talented aunt, coincidentally named Maria, who gifted us with our wedding and anniversary cakes. 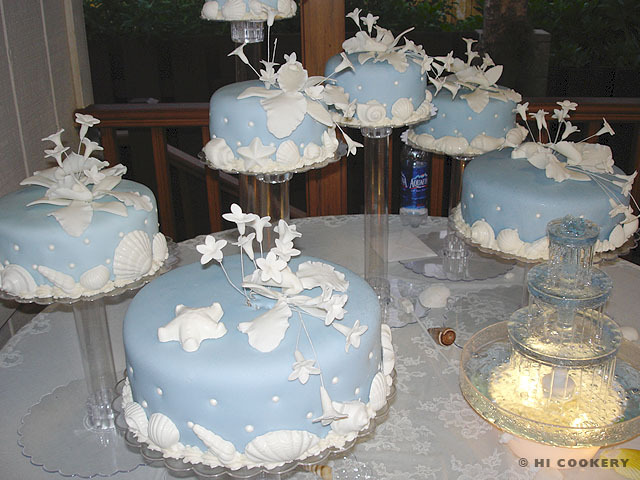 For our 10th anniversary in 1996, Auntie Maria B. decorated a spectacular sea shell themed cake, as our vow renewal ceremony was at the beach in Islander’s hometown in Hawaii. We attempted to recreate the sea shell cake on a smaller scale and named it the “Stella Maris (Mary, Star of the Sea) Cake.” We originally made the dessert to celebrate Our Blessed Mother’s birth week with Islander’s brother at one of his Marianist-hosted event. But we are posting the preparation pictures on our blog on the Feast Day of the Most Holy Name of the Blessed Virgin Mary. Line 6-, 8- and 10-inch round cake pans with wax paper circles and grease the bottoms and sides. 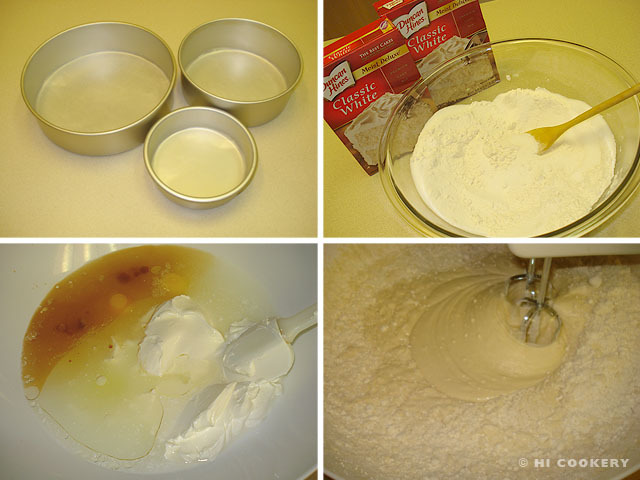 In a large bowl, sift the flour with the white cake mixes and sugar. In a larger mixing bowl, place the water, sour cream, eggs, egg whites, oil, vanilla and almond extracts. Beat well with an electric hand mixer. Gradually add the flour mixture and beat until the batter is well-incorporated and smooth. Pour about 2 ½ cups of batter into the 6-inch pan, 3 ½ cups into the 8-inch pan and 6 ½ cups of into the 10-inch pan. Bake in a preheated oven at 325 degrees F for about 45 minutes, adjusting the time as necessary. Check with a toothpick for doneness. Remove from the oven and lightly flatten the tops of the cake. 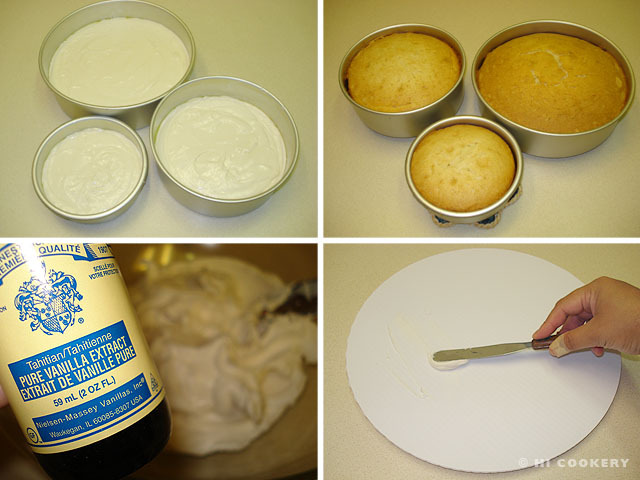 Make the frosting while the cakes cool completely. Smear a little frosting on the bottom of an 8-inch cake plate or board and invert the 6-inch cake on top. Peel off the waxed paper. Repeat for the 8-inch cake on a 10-inch cake plate or board and the 10-inch cake on a 12-inch cake plate or board. Brush off any crumbs. Generously drop a heaping mound of frosting on top of the cake(s). 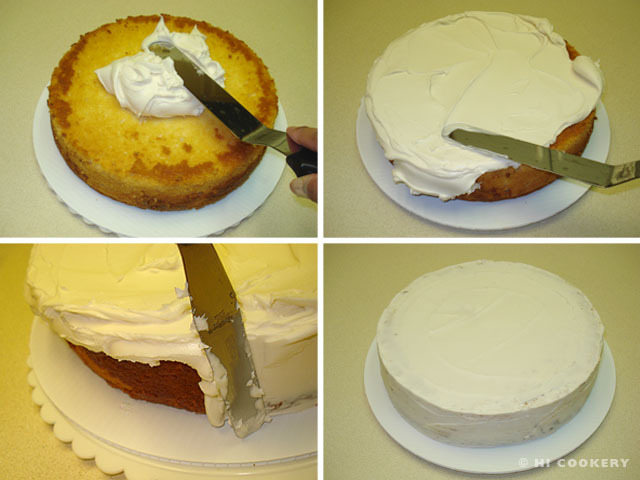 Use a spatula to spread it out over the top of the cake and down to the sides. The cake(s) should have a thin layer of frosting to act as an adhesive to the fondant. Knead the fondant with a little vegetable shortening until it is pliable. 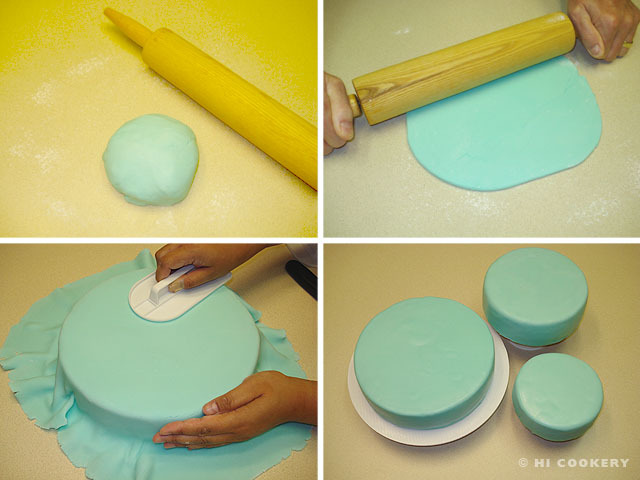 On a clean, flat surface, make a large ball with the fondant, flatten it, then roll out to 1/8-inch thick to the diameter + two sides + two inches for each cake. Carefully drape the fondant on top of the cake. Quickly smooth out the top and sides. Cut off excess fondant from the base of the cake. Repeat for the other remaining cakes. 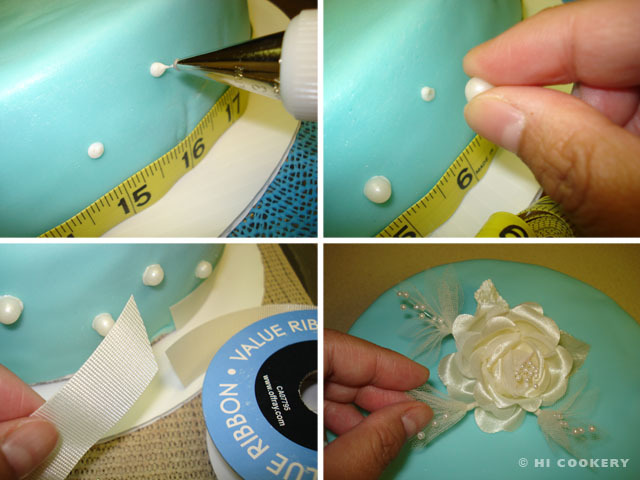 Measure out the placement of the edible pearls. Using a small round tip, pipe a small dot of frosting and position the pearls in an alternating pattern. Lightly press them onto the cake. Trim the base of the cake with ½-inch wide ribbon, securing the ends with frosting. 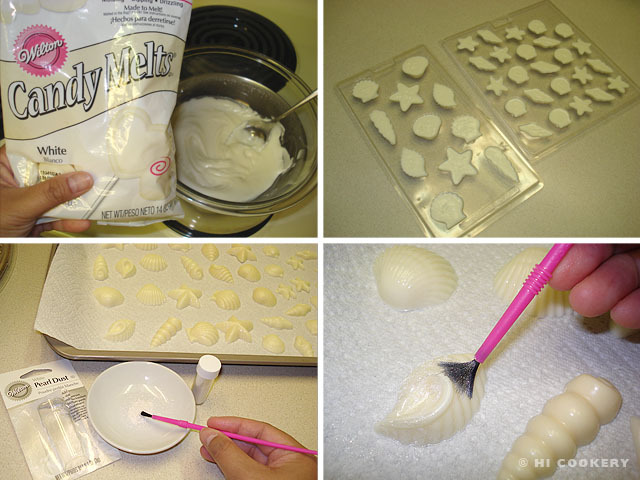 Melt the white chocolate or vanilla candy wafers and pour into sea shell-shaped molds. Refrigerate until solid. Unmold and paint each shell with edible pearl dust. 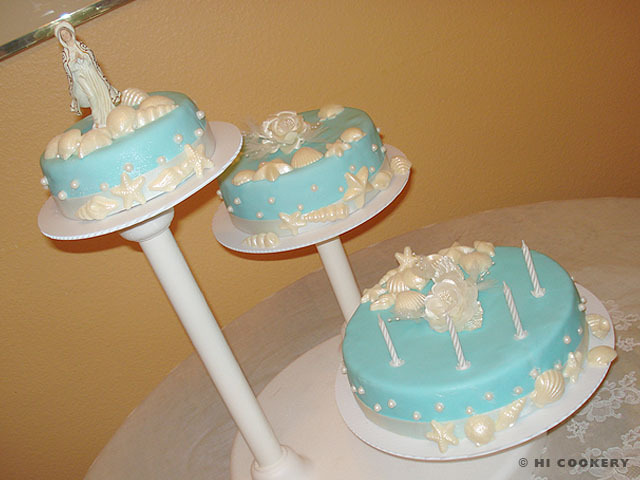 Position the candy sea shells randomly on the cakes. Add other decorations, such as matching silk flowers, birthday candles and a mini Mary statue, and display on cake stands. Compared to Auntie Maria’s cake, ours is not as professional-looking but it was a project that we both worked on together. Islander baked, frosted and decorated the cakes and Highlander rolled out the fondant and measured out the position of the edible pearls. This cake almost turned out to be a Food Flop. The craft ribbon was too wide at 7/8 inch (Walmart did not have ½ inch ribbon in stock) to trim the base circumference of the cakes. 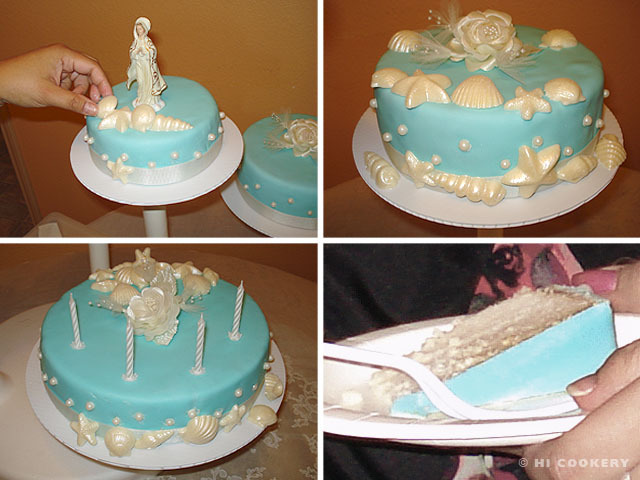 The color coating looked too turquoise and Tiffany blue rather than baby blue as printed on the fondant container. Fortunately, the cakes and candy sea shells did not melt and survived the transportation from our house to the venue in South Texas (temperature was about 95 degrees F). On arrival, however, Highlander accidentally dropped the last tier on the table, smashing part of the cake and tearing into the fondant, but Islander covered up the damage with candy sea shells and turned the cake towards the back. Our Stella Maris cake was a labor of love for Our Lady. Learn more about her and look at her list of names from the litany at the Mary Pages website.